We are all so egocentric that we often forget to think who the viewer is. Artists bank on that one. 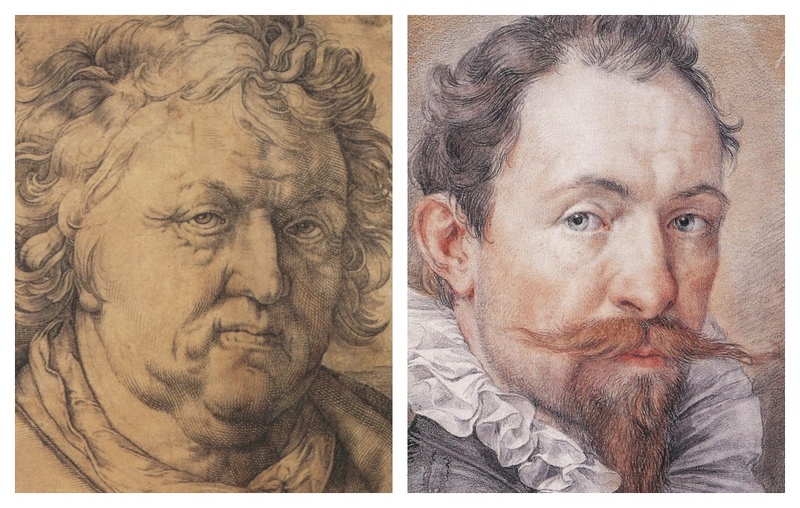 In this drawing Hendrick Goltzius has drawn Jan Govertsz van der Aar as St. Luke. Most people know Luke as the gospel writer but he was also the patron saint of painters because he was thought to have drawn the Virgin Mary from life. 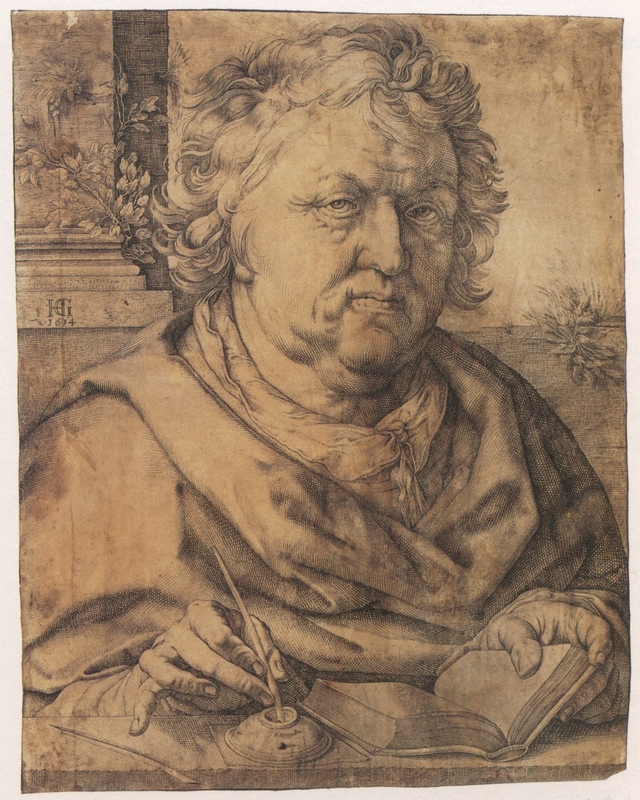 Goltzius, Portrait of Jan Govertsz van der Aar as St. Luke (1614) Pen and brown ink on parchment. Kunstsammlungen, Coburg. It was a common subject and a good opportunity to paint a self-portrait for public display. 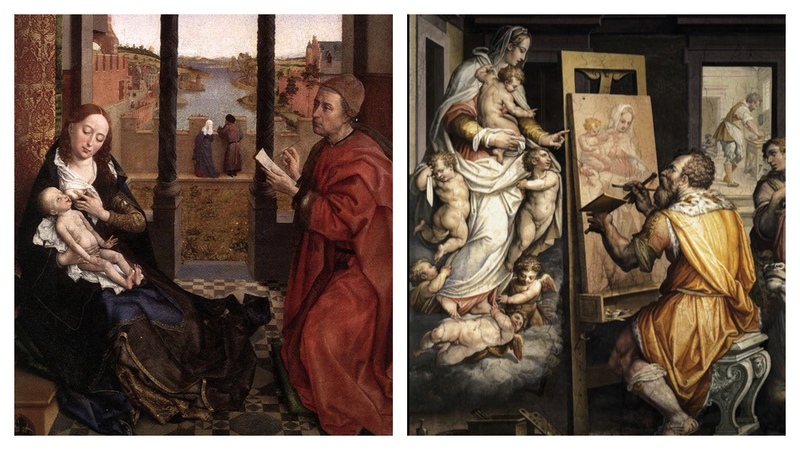 At left is Rogier van der Weyden's celebrated painting from the late 1430's in Boston; on the right an altarpiece from the 1560's by Giorgio Vasari. The first task, as always, is to consider whether the sitter resembles the artist. Here there is not as much similarity as we often see but enough to make a difference: van der Aar is an alter ego of the artist. The evidence is in the messy hair, the similar eyebrows, lips and contour of the jaw. All else is seemingly different but that does not lessen the significance of the intentional similarities. 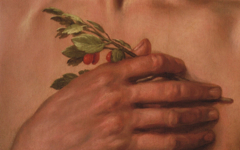 R: Detail of Goltzius' Self-portrait (1593-5) Chalk and watercolor on paper. Albertina, Vienna. 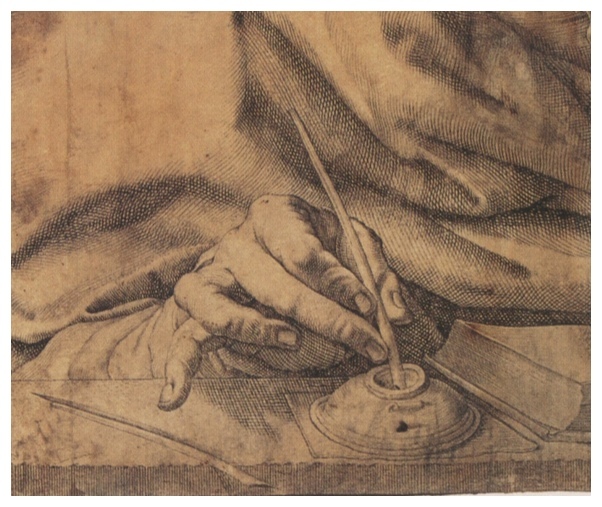 Van der Aar is writing as though he is composing his gospel but he holds a pen as the artist would have to make the drawing. That means, as an artist, he is looking at himself in the mirror, drawing himself. His pen is poised next to his pot of ink. A quill lies across the balustrade like one of those knives perched on the edge of a table in Dutch still-life paintings. As in those examples, it suggests that the artist's tool straddles both realities whether represented as an actual pen, a writing instrument or a sharp knife. It is part of the scene in the picture and of the studio outside. What is so critical to realize here is that the artist making the drawing, facing St. Luke, must be the Virgin. Now we are too, standing where the artist once was. 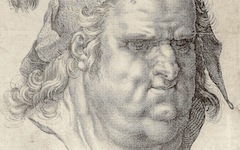 Goltzius thinks of himself as the divinely creative Virgin and his drawing, probably, as an Immaculate Conception using a pun on conception's double meaning. We, too, are creative, a fact made clearer through our own interpretation. We do what the artist did in reverse, unravel his thought. Art encourages independent thinkers to view art like the artist and thereby open our eyes to our own creativity, imagination and spiritual essence. There is Virginal potential in all of us. 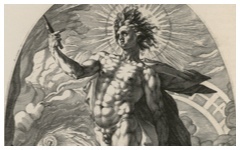 Apollo, god of poetry and music. How could this engraving not be about art? Original Publication Date on EPPH: 04 Oct 2013. © Simon Abrahams. Articles on this site are the copyright of Simon Abrahams. To use copyrighted material in print or other media for purposes beyond 'fair use', you must obtain permission from the copyright owner. Websites may link to this page without permission (please do) but may not reproduce the material on their own site without crediting Simon Abrahams and EPPH.